Santa Clarita and state officials joined members of the California Department of Transportation (Caltrans) and the Los Angeles County Metropolitan Transportation Authority to break ground on a $72 million Interstate 5 truck lane project Thursday morning. The project will add a truck lane in both directions of the I-5 corridor to help reduce traffic congestion and enhance safety on a stretch of roadway that is traveled by nearly 200,000 vehicles and 19,000 trucks daily. The southbound truck lane will extend 3.7 miles from Pico Canyon/Lyons Avenue to State Route 14. The northbound truck lane will extend 1.4 miles from SR-14 to Gavin Canyon. 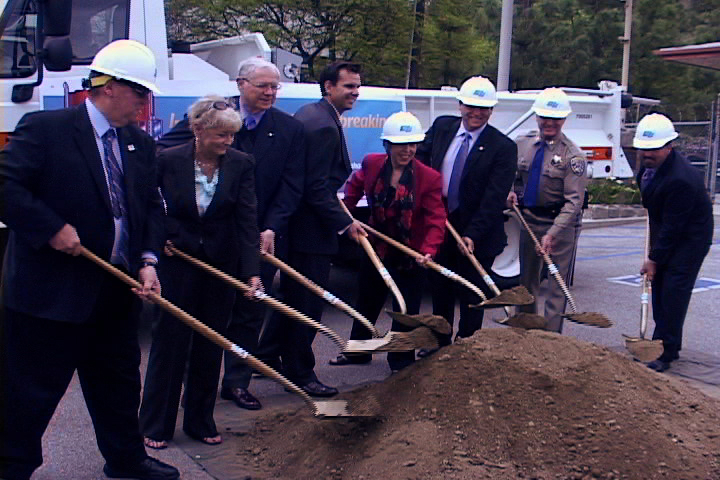 Caltrans and Metro officials, members of the Santa Clarita and Glendale City Councils and elected state representatives put on hard hats and dug shovels into a mound of dirt at the Caltrans North Region Survey Field Office in Stevenson Ranch Thursday morning to signify the start of the project. “I-5 is the backbone of California’s freeway system and it vital to our ecomony,” said Caltrans District 7 Director Mike Miles. The State Highway Operation and Protection Program invested $70 million in the project. An additional $2 million is being provided by Measure R, a 2008 voter-approved tax hike. Construction is estimated to be complete in early 2014.